of Hastingleigh that year, George Tappenden and Stoddard Fagg. start of the 1st extension area. of Hastingleigh, George P Tappenden and Edward (Ted) Clark, churchwardens, and ML Ashton, secretary of the Parochial Church Council. 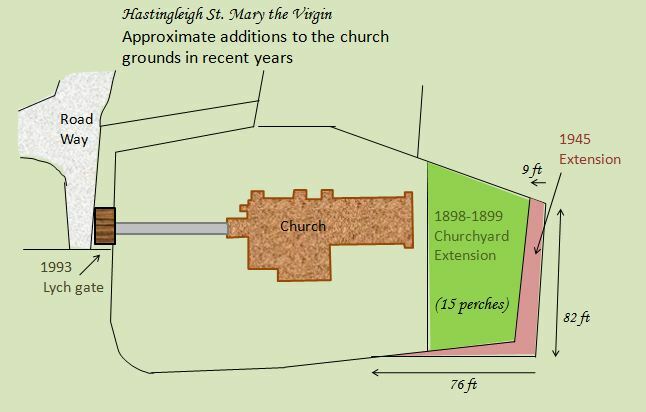 The Forge family graves are all located in this cemetery extension area. 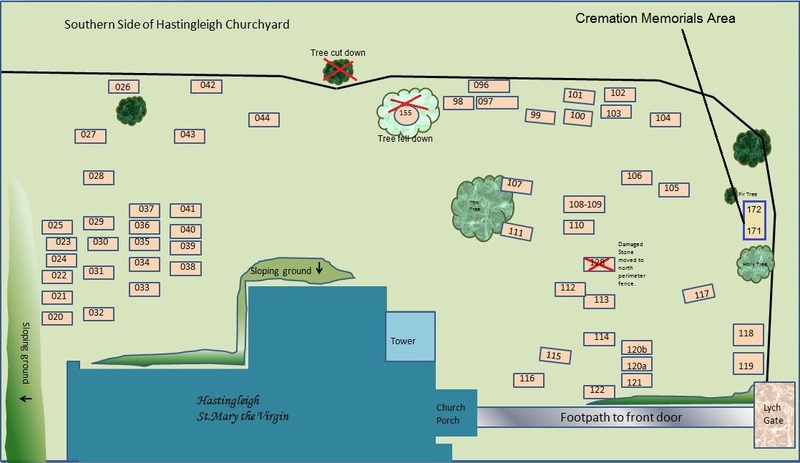 The picture beneath shows the 4 sections used for the graves and memorials plans. close to the east wall. All the burials in this part of the cemetery are post 1898. 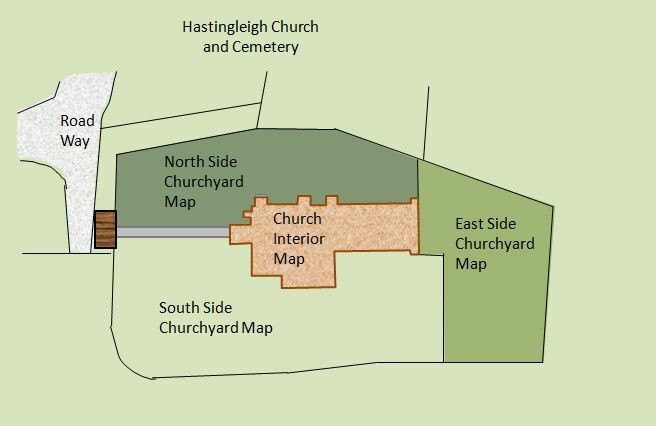 The list in the panel to the right of the map, lists the main surname on the gravestone. 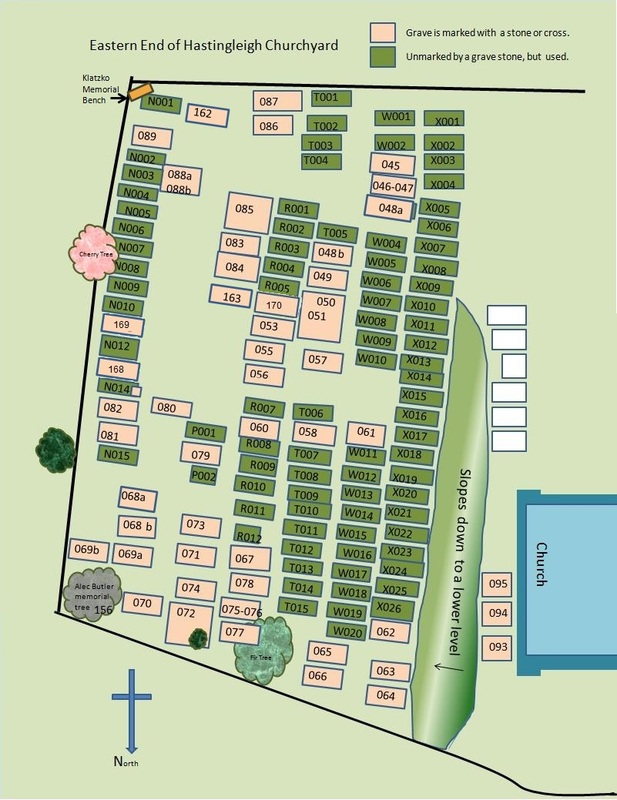 The list below, gives the surnames buried in the corresponding plot noted in the picture above. No markers unless otherwise stated. been planted there and is thriving. There also once existed a pathway to a door on the south wall of the church which is now blocked up. 033-Mugford 098-Kirby FS 112-Marshall 155-Wetherley-Mein (tree plaque) NB: This tree toppled in 2014.
the vault, making the surface fragile. Please do not walk near this grave stone. The ground is very likely to give way soon.